In its enthusiasm to spread the word about the rapid uptake of renewable sources of energy, the Climate Reality Project recently circulated the picture below. It references the amount of wind energy, in particular, that is now being generated in the German State of Schleswig-Holstein. 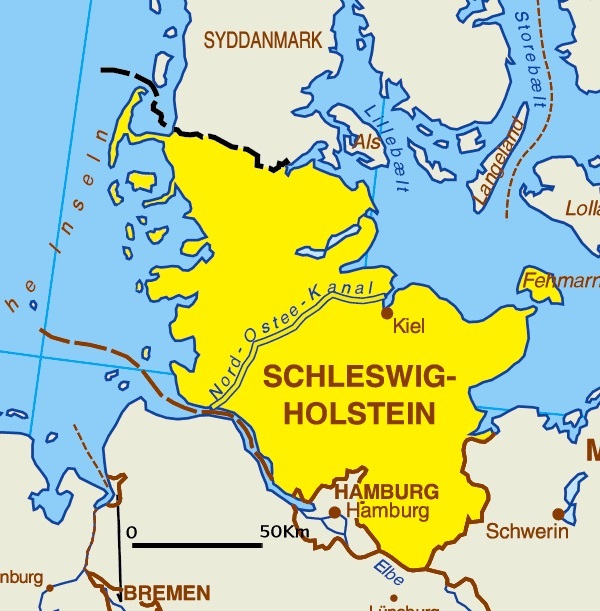 The Northern German coastal State of Schleswig-Holstein will be able to mathematically meet its electricity demand fully with renewable energy sources this year if wind yields reach at least average levels, Robert Habeck, Minister of Energy said when presenting a new study last week (May 2014). This means that the amount of wind (and solar) electricity generated in Schleswig-Holstein will be equal to total demand, but these may not match in terms of timing. 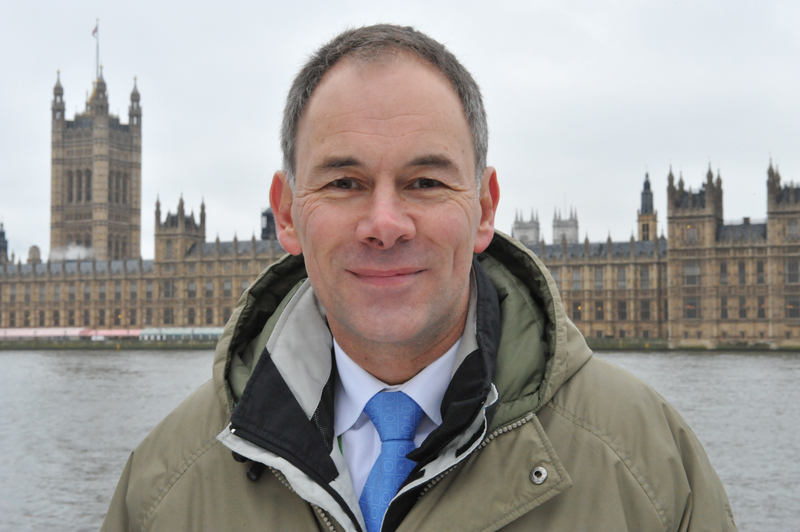 At certain times the state will export surplus wind generated electricity into the grid and at other times it will need to draw from the grid to meet its needs, particularly during periods of little wind. Nevertheless, it is quite an achievement, even though it highlights the need for a substantial backup system for renewable electricity generation. 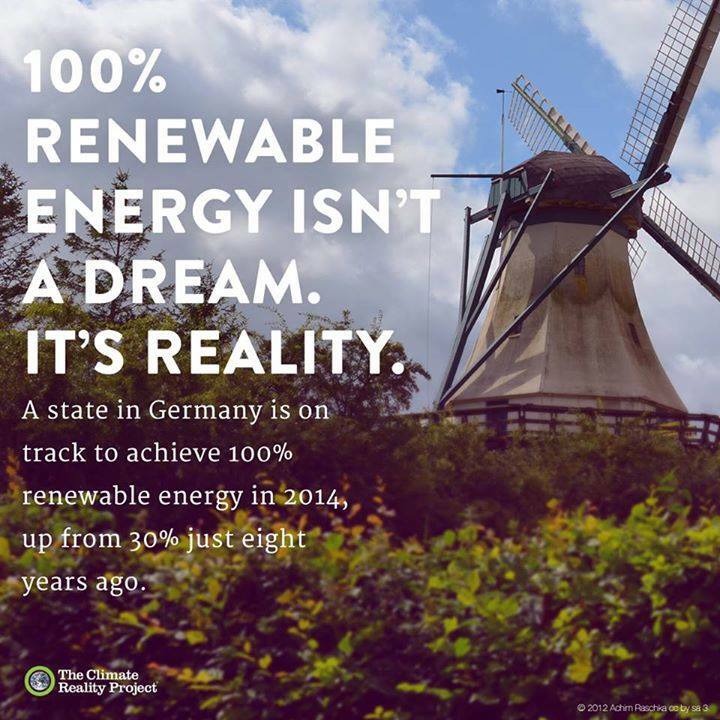 But there is a second major reality associated with “100% renewable energy” statements. 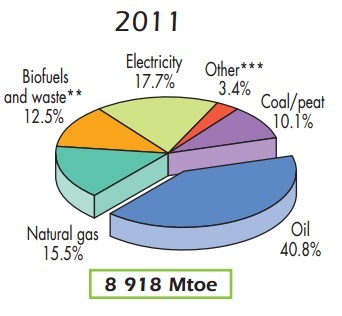 We live in a global economy that is only partly powered by electricity, to the extent that even if this electricity is generated entirely from renewable sources, the percentage of renewable energy in the final energy mix will still be less than 20% (see below). Even in OECD countries where electricity is more widely used, this only rises by a few percentage points. The largest slice of final energy (i.e. energy that is used by the final consumer for the delivery of an energy service, e.g. mobility) is oil, used mainly for mobility in road vehicles, planes, trains and ships. Natural gas and coal are also very large, used primarily for industrial processes such as steel making, chemical plants and similar. Natural gas is also used extensively throughout the world as a residential fuel for boilers and direct home heating. Coming back to Schleswig-Holstein, the actual percentage of renewable energy in the final mix is probably higher than most areas, not just because of its renewable electricity production but also because of the availability of biomass from the agricultural sector. In Germany as a whole, even if all the electricity was sourced from renewable energy (but it isn’t) and adding to this the biofuel and waste energy sources, a level of ~27% renewable energy would be reached. For Schleswig-Holstein with its current level of renewable generation, that probably translates to ~30% today. That’s an impressive feat, but it isn’t 100%. Agreed, however, is it possible, ever, to stop burning fossil fuels? Most scientists now say we have to leave all the remaining fossil fuels in the ground or the climate will become too unstable for life on the planet. This is the discussion at the UN next week at the Climate Summit. Yes, but it’s going to take a while. 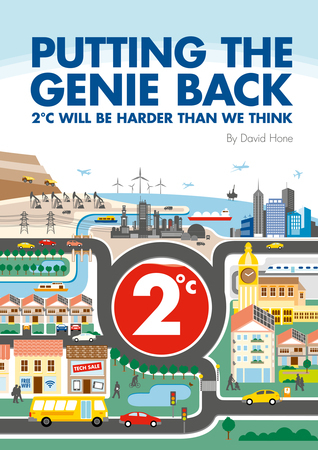 It’s also possible to live in a world that uses fossil fuels (perhaps not on the scale of today), but doesn’t emit additional CO2 to the atmosphere. That will take a while as well.